Evan Spiegel the CEO at Snapchat has apologized for the emails he sent while he was in college and a member of a fraternity. The emails celebrated being drunk and convincing women from a sorority to perform different sexual acts. The emails, which were laced with profanity were published this week by a blog and mostly were related to the CEO of Snapchat organizing fraternity parties at Stanford University in 2009-2010 for his fraternity Kappa Sigma. In one of the emails, Spiegel recounts that he was so drunk he had peed on a woman that was in bed with him. In a prepared statement he said he had been mortified as well as embarrassed that his idiotic emails while in college had been made public. He said he did not have any excuses. He said he was sorry that he wrote them and was a jerk for having done so. However, he said they do not reflect who he is today or his views regarding women. The disclosure of his emails is another growing pain that Spiegel, who is just 23, has faced. His company based in Los Angeles makes a mobile app for photo messages that disappear. 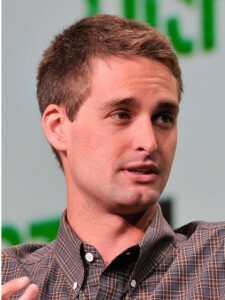 Spiegel in 2013 turned down an offer for Snapchat to be purchased by Facebook for $3 billion. He continues to build his business. Nevertheless, he has encountered some problems including issuing an apology for a data breach that took place in January. Earlier in May, Snapchat settled some claims by the Federal Trade Commission in the U.S. that said it deceived its users by making false promises that the photo messages actually disappeared. The comments by Spiegel might endanger the chances the company has with its advertisers once the company develops a business model, said one analysts who gives advice to companies about how to handle their reputations online. The analyst said more than an apology was need and said Spiegel may have to step down as CEO. Spiegel hired a former Google executive to handle its security issues and a lobbyist to educated policy makers regarding its business. Snapchat’s popularity continues to increase with over 700 million snaps per day. There are also over 500 million stories that are viewed daily, said company officials.